Protesting from a freeway overpass is a way to reach as many as several tens of thousands of people. This page provides some tips on how to make very cheap signs that are large enough to be seen by passing traffic from an overpass. Such signs are good in any situation, where you want a short message to be readable from a distance of nearly a city block. Caution: Be careful and do not take any chance of dropping any object into traffic. On a busy freeway there may be around 30-40k cars pass total in both traffic directions during a 2-hour protest. Even a lot of small towns have a freeway nearby with a suitable overpass. So, you can do this nearly anywhere. All you need are a couple of friends and some signs. They call this “freeway blogging” and it is very effective. Even a couple of people can get their message out to thousands of people in a short time. If you don’t have a suitable overpass, find a busy street corner. Send images of your event, big or small, via the contact tab above, if you want it posted on this blog. Even showing small events here is helpful for encouraging others. 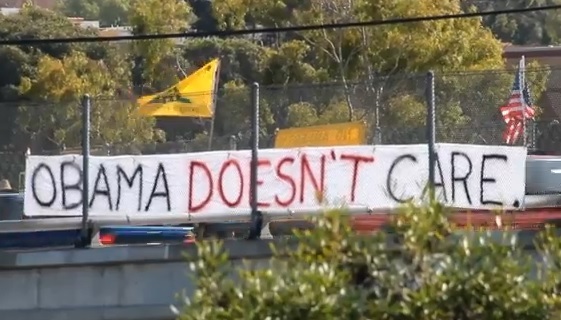 If you have one huge sign with big letters that stands out above all the restand reads “Impeach Obama,” at least the drivers will likely get the overall purpose of the demo. If smaller signs are missed, they can be read by cross traffic on the overpass or in photos/videos posted afterwards on the web. The 24×36 and 36×48 inch black and white text signs seen in the video at the bottom can be printed at a Staples Office Supply. The small sign cost $3.29 and the larger sign cost $6.58 to print on plain paper in black and white. Other print shops may do the same work just as cheaply. Office Depot prints 24×36 inch posters in BxW for about $3.00. The downloadable files here were made for 24×36 inch prints, but you can also have the printer fit the same images to 36×48 inch paper. Lay the paper on a flat surface. Apply adhesive to the cardboard. Then press the cardboard down on the paper. You can order cardboard in quantity per Internet as below. You can order sheets of 24″x36″ cardboard at this site for about $1 per sheet, but you have to order 50 sheets at a time. If you want something more durable than cardboard, would recommend corroplast (corrogated plastic), which may be available at art and craft stores or plastic stores. It is lightweight, tough and easy to cut with a razor blade. If you are going to make a lot of signs it probably easier and cheaper to order the cardboard sheets in bulk. Local businesses that do boxing for moving or shipping may sell pre-cut sheets of cardboard. Or, you may be able to find single-sheet cardboard at places, such as Dollar Stores. The sign was stapled to a yardstick with a heavy duty stapler. If you use a gun with longer staples (1/2 inch) they will go all the way through and you can bend the staple ends over on the other side to make it less likely they will come loose. You can also glue the sign to the yardstick before stapling it. If you drill a small hole near the top of the yardstick, you can hang the sign on the overhead fence. If you are going to be in a windy area, you need a piece of cardboard attached to both sides of the yardstick and that are stapled or otherwise connected on the edges, so that the sign is strong enough that it will not bend in the wind. You can paint your signs with cheap, tempura paint that you can buy at a arts & craft store, which costs a couple dollars per pint for neon paint. Dilute the paint to about a 50/50 water solution, or whatever ratio makes the color light enough, and just paint it on the sign with a paint brush after it has already been printed. The black printed letters will show though a light coat of tempura. Black letters with a bright yellow background gives the best contrast and adds a little color to your overpass display. You can see some signs painted in this way in the video at the very bottom of this page. Even, if the paint job, looks sloppy close up, it can look good from a distance. The text image as produced on MS PowerPoint and exported to a JPEG image file. The “Paint” application was used to stretch or scrunch the image to the relative dimensions of the sign, so that the text fits the sign. You want the letters to cover the entire sign, though you want to leave enough white that the text stands out. You can take the image file to Staples and give it to them on a USB memory stick for them to print out. Or, you can e-mail it to them. Reportedly, this company makes cheaper banners. The cloth banner in the image below was made by spray painting a length of linen, bought at a fabric store. It is clamped to the fence with clamps bought at a hardware store. The cloth cost about $25 for this banner. The clamps are $2 each and about 16 clamps are used in this photo. If a strong wind is blowing in the wrong direction it can sometimes be difficult to keep this banner on the fence. The letters in this example are at least two feet high and probably become readable at a distance of about 1,000 feet. Banner made from white linen. The image sign of Obama crowning himself was rasterized with free software, called “Rasterbator,” by the German kid who produced it. It was downloaded from the Internet for free. It prints on multiple ordinary 8.5×11-inch plain paper sheets. The sheets are trimmed and glued on cardboard to re-assemble the image It a good deal of work, but a cheap way to make a large sign with an image. This image sign cost about $10 in materials to make. Many printers have an option to allow you to print to the edge of the page, which eliminates the edge- trimming necessary. Wheat paste is very cheap to make. It only takes a few minutes to cook a batch, using flour, sugar and water and adheres better than the relatively expensive spray adhesive you can buy at craft stores. It does not dry immediately. So, if you make a mistake, you have a chance of correcting it. As it dries it polymerizes and makes a very strong bond. 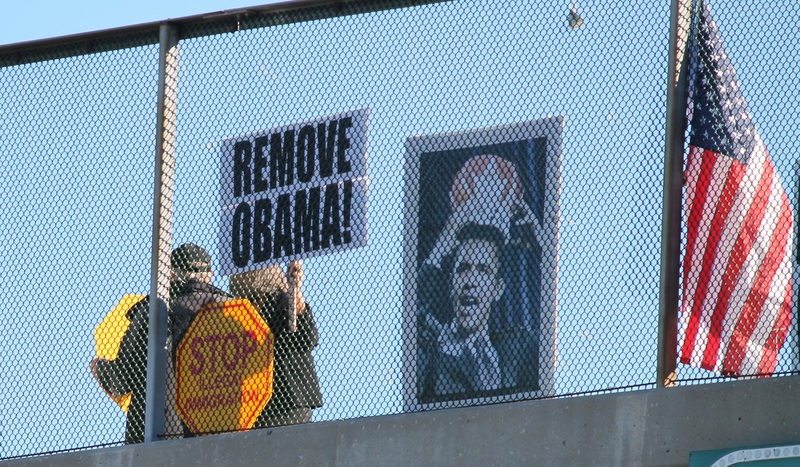 An overpass with a high chain-link fence, as in the clip below, is perfect for such a protest. Make sure, though, there is no gap at the bottom, between the fence and the overpass, where a sign could potentially drop through. Also, make certain nothing can go over the top into traffic. 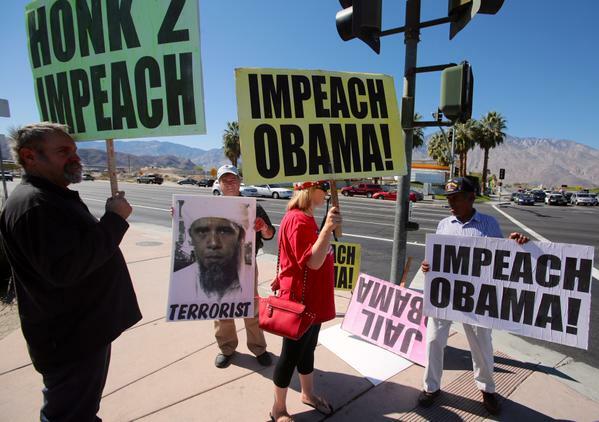 Pingback: Sign-Making Tips for Impeach Obama Protests | Coalition to Impeach Obama Now! Pingback: Killer Poster for Impeach Obama Protests | Coalition to Impeach Obama NOW!